Here's the ideal choice for first-time suit buyers looking for a comfortable wetsuit that fits like a second skin. Now available in new colors in a choice of three neoprene thicknesses. You won't have to worry about that when you're wearing SCUBAPRO's SPORT suit. Offered in three thicknesses, the SPORT is made from a special super-soft neoprene covered with high-stretch nylon. SPORT suit neoprene is a variation of X-Foam, a neoprene formula that not only keeps divers warm, but also complies with the very strict P.A.H. (Polycyclic Aromatic Hydrocarbons) test requirements that help protect both divers and the ocean. SPORT suit neoprene is softer and more flexible than standard neoprene (albeit less resistant to water compression), and it has a wider-weave nylon on the outside. This combines to deliver more softness and flexibility than any other SCUBAPRO suit, making the SPORT extremely easy to climb in and out of, plus it maximizes range of motion, radically improving comfort while reducing those feelings of restriction. Even better, the suit's interior is lined with two plush materials that feel so good against the skin you won't ever want to take this suit off. The external colored panels on the wrists and ankles are styled to appeal to fashion conscious divers, but they are more than purely design touches. The undersides of these panels seal against the skin to prevent water entry, and they are backed by zippered wrist and ankle closures that help keep water out and make donning and doffing that much easier. The SPORT is designed with fewer technical details than the Everflex, allowing it to be an economical choice as well as a comfortable suit to wear. 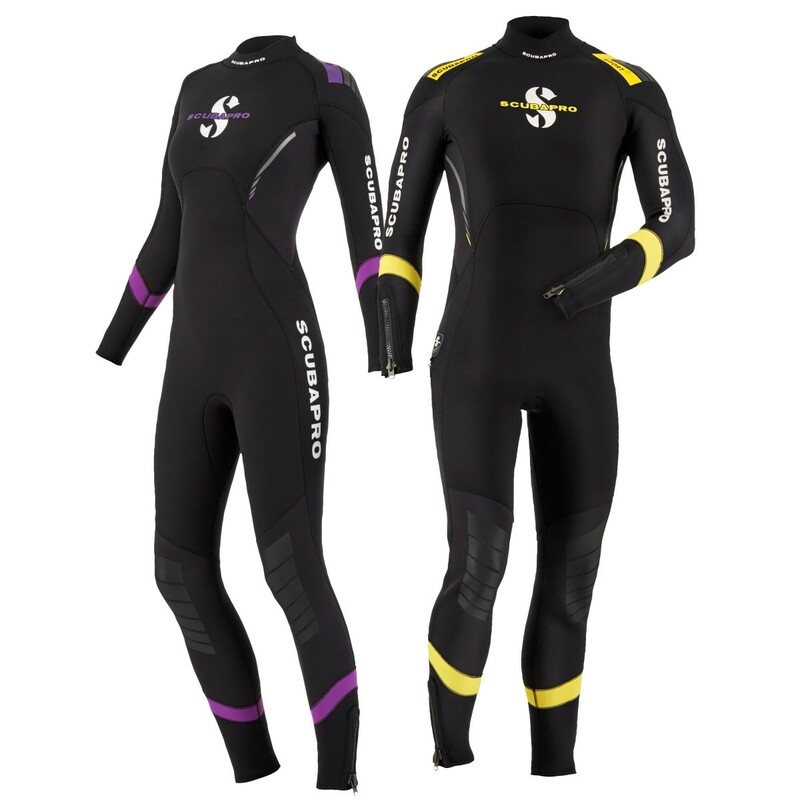 This makes it particularly well-suited for new divers, as well as for casual divers who look for lots of stretch for easy donning and doffing and maximum freedom of movement as their main criteria when selecting a wetsuit. 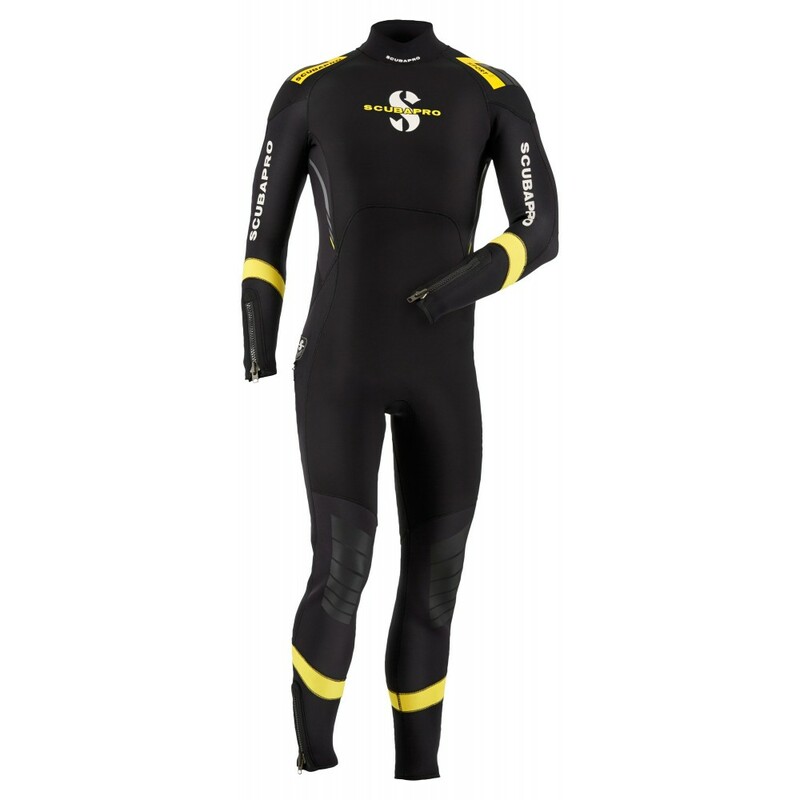 The new SPORT 7MM is the ideal wetsuit for new divers who enjoy cold water diving. As comfortable as a cold water steamer can possibly be, the SPORT 7MM fits like a second skin. Its soft neoprene and triathlon cut create a lot of comfort and allow for maximum range of motion in the shoulder and arm areas. This suit is easy to put on and take off and it provides much more freedom of movement than traditional 7mm wetsuits. A soft and flexible wetsuit that's easy to put on, is comfortable, and affords lots of freedom of movement is a wetsuit you're going to enjoy wearing. The SPORT hits all these marks, making it must-have thermal protection for casual divers or first-time suit buyers. • Made from a special super-soft neoprene covered with high-stretch, wide-weave nylon. • Sport suit neoprene is a variation of X-Foam, a neoprene formula that not only keeps divers warm, but also complies with the very strict P.A.H. (Polycyclic Aromatic Hydrocarbons) . • High-stretch neoprene is great for hard-to-fit divers who can now enjoy a suit that molds comfortably to his or her body. • Softer and more flexible neoprene makes it easier to put on and take off, maximizes range of motion and improves overall comfort. • Triathlon cut employs wider panels covering the underarm and back areas; this creates a more "sporty" pattern that allows unrestricted arm and shoulder movement when swimming. • Wrists and ankles are fitted with sealing panels backed by zippered closures that help keep water out and aid in pulling the suit over arms and legs. • The interior is lined with two plush materials that enhance comfort and warmth, dry quickly and provide cushion beneath wrist and ankle zippers. • Glued and blind-stitched seams keep warmth in and water out. • Diagonal-cut YKK rear zipper and wrist and ankle zippers are comfortable, improve flexibility and simplify donning and doffing. • Abrasion-resistant fabric on shoulders, seat and knees protect against shifting gear or when sitting or kneeling. • Having fewer technical details than the Everflex allows the Sport to be an economical choice as well as a comfortable suit to wear. • Available in 7mm, 5mm, and 3mm thicknesses in 6 mens and 6 womens sizes.